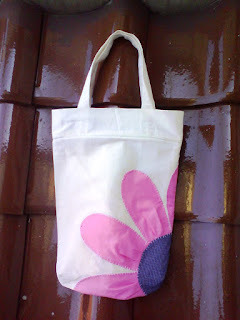 My new handmade tote bag with flower. I have no choice to pick another left out fabric because these are the only one I have to make the flower. Mostly I spent my time to think (spaced out, I mean) rather than to finish the bag quickly. Now something popped on my mind. I have an idea to open a small shop on Jalan Juanda, a Sunday morning market near my house. Come on, I'm so enthusiastic about this when I remember the handbag shop picture. But now I'm thinking seriously about this, I have no idea how much the price is. I'm going to make several tote bags like this one, but every bag should be different. It's a handmade, guys! !